The girls love to help me bake. Riley is the best egg cracking-six year old I have ever met and Talia can engage in a thoughtful conversation comparing and contrasting various features of an Oster bread machine versus a Hamilton Beach. But I have to admit, when it comes to meal preparation, I find myself shooing the kids out of the kitchen. Last night I was reminded why it is important to embrace the chaotic mess after I encouraged the girls to cook dinner for the whole family. 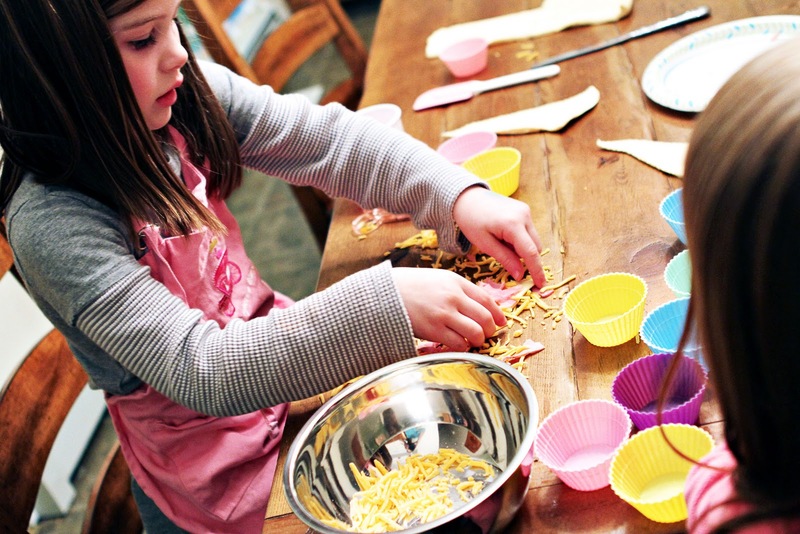 Cooking is a valuable life skill that helps kids to develop their independence. Preparing a meal for the whole family to enjoy gives the girls a huge confidence boost as they spend quality time with Mike and I in the kitchen. Santa brought the girls an adorable cooking set for Christmas and yesterday, we decided to put it to good use! They couldn't wait to put their appropriately sized bowl scrapers, measuring cups and kitchen scissors to work! Not only did they have fun making these ham and cheese croissants, everyone actually LIKED them. Unheard of. 1. Choose a simple recipe with less than 5 ingredients where exact measurement is OPTIONAL :). 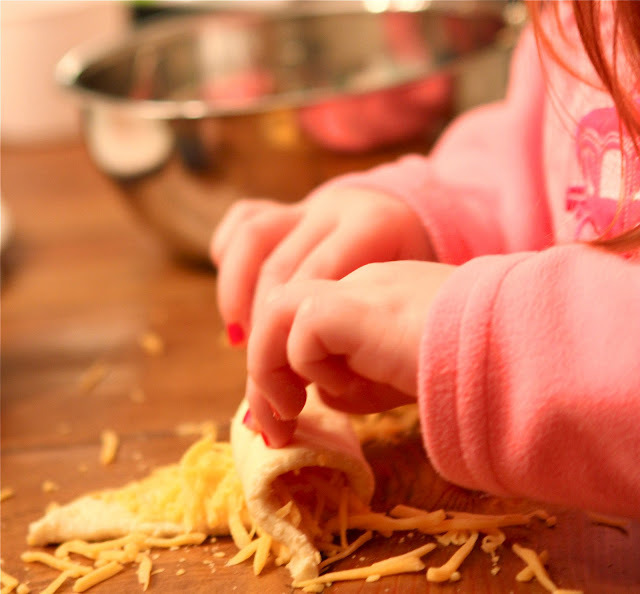 Provide your child with safe opportunities to tear lettuce, sprinkle cheeses and spread sauces or butters with blunt knives or spoons. My girls are young so I stay away from cutting altogether unless it involves simple cutting that can be done with kid safe scissors as seen in the pictures. 2. Be organized. Have all of the ingredients and equipment sorted for each chef at their own seat, in their own area. 3. Take time to explain the process, talking about ingredients and equipment. 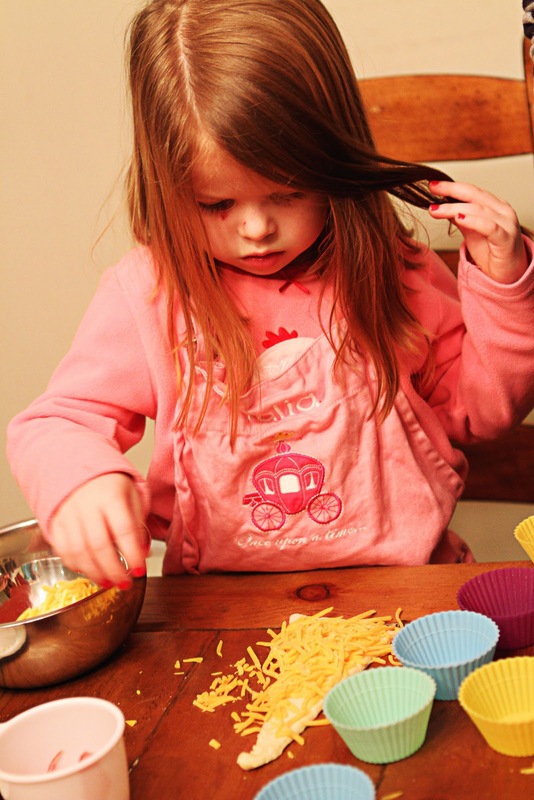 If you are using cooking as a learning tool it is important to be as talkative and descriptive as possible, especially with younger children. This can be a good time to teach children about color, shapes, textures, measurements, temperature and over all nutrition. 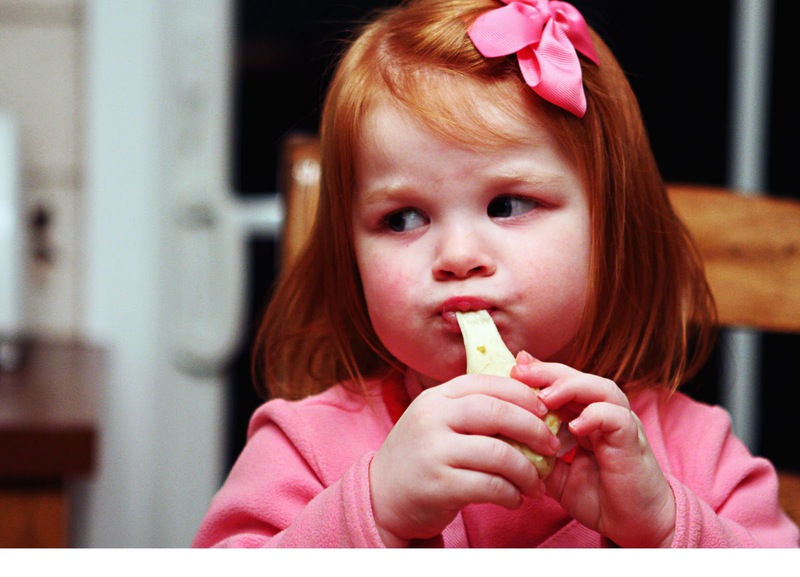 Your kids may surprise you by eating their own creations, even vegetables. 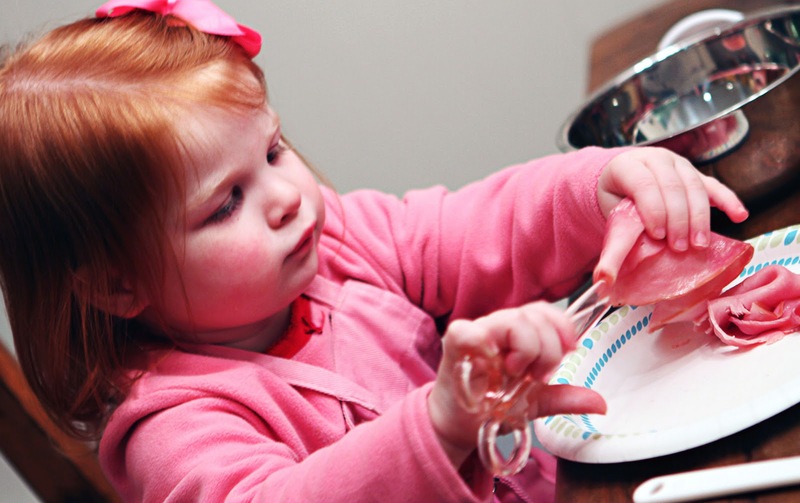 Our girls will often try unfamiliar foods when they transform them into personal "creations." They don't necessarily commit to liking them, but it's a start! 4. Make it fun. Cooking together should be an enjoyable experience. It should be fun to work together in the kitchen, not stressful! Try to contain your anxiety about crescent dough dangling from the chandelier until after the kids leave the room. 5. 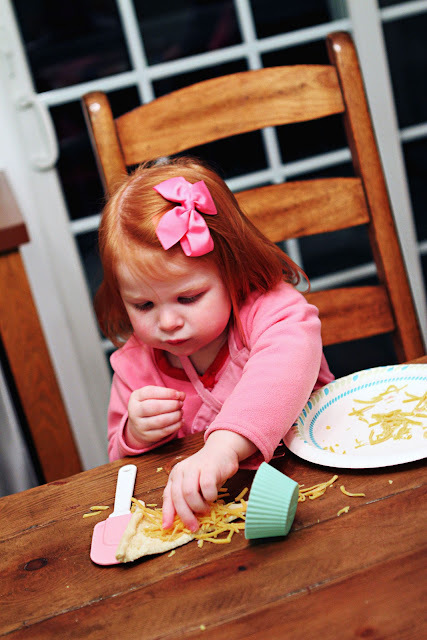 Involve the kids in the clean up process. As a parent, you are aware that clean up is a big part of meal preparation. The kids should be made aware of that too! Of course you're not going to have toddlers washing dishes but they can help pick things up off of the floor and bring dirty dishes to the counter! They should know that cooking is a lot of fun, but it is a little bit of work too! 6. All good cooks wash their hands before touching food!!! Don't forget to educate the kids on the dangers of eating raw foods like eggs and meat or unwashed fruits and vegetables. Even if you're like me and turn a blind eye when the girls steal a few bites of cookie dough, the raw food discussion is one worth having. 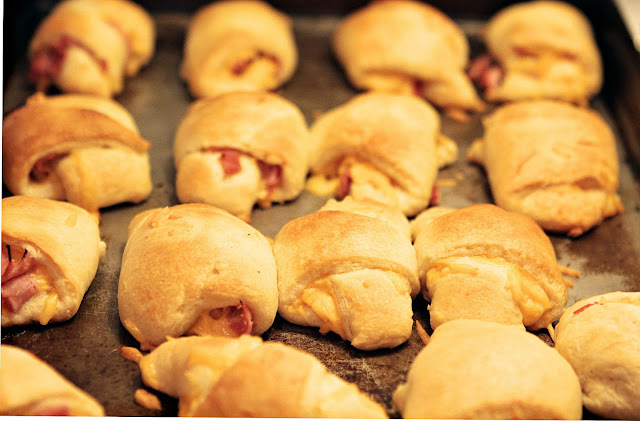 This recipe for ham and cheese croissants is simple and hardly a recipe at all! We adapted it from our Cook it in a Cup recipe book by Julia Myail. It's basically the same recipe, minus the cups! Our croissants didn't fit so well in the cups so we saved ourselves some time in the dish washing department and put them back in the cabinet! Thank goodness Mike was there to supervise while I shot a few pics of the action! Riley and Talia were very serious about their work! Lola gave up trying to cut her ham into little pieces and decided it would just be easier to eat it. Here she is making her cheese croissant. She then turned her croissant into a "meatball" and decided to give it a try hoping it would taste like that sugar cookie dough we made a few weeks ago. It didn't. The girls were beaming with pride as these came out of the oven. They were so yummy! Prep Ahead Plan: Try preparing these the morning or night before baking them. Cover them and leave them in the fridge until you are ready to bake them. 1. Separate each of the crescent triangles (or role out and cut the dough into 16 triangles). 2. Sprinkle an equal amount of ham and cheese on the center of each triangle. 3. Roll up each triangle and place on an ungreased cookie sheet. 4. Bake for 10 minutes in an oven that has been preheated to 425 degrees. Enjoy!!! 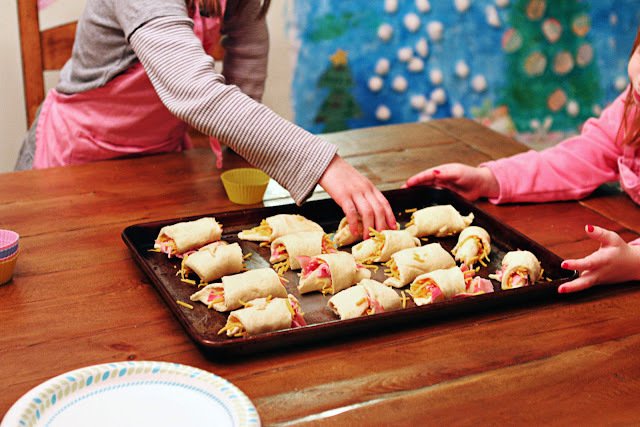 Copyright © PrepAhead and Dine In: Cooking with Kids: Ham and Cheese Croissants. All Rights Reserved.